Telling stories may be easy for some but finding an audience to listen to it is the challenge. What makes this particular story important to share? 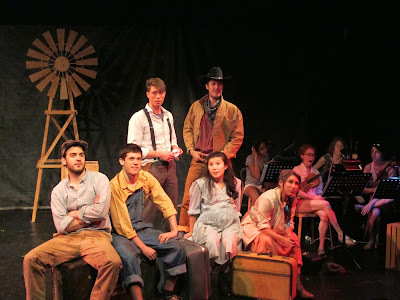 In the unfortunately youthful new musical Dust Can't Kill Me, we're introduced to Jack Omaha, a storyteller with a tale to tell about life in the Dust Bowl. In Dust Can't Kill Me, we journey to the past as we watch a group of strangers search for a way out of their current pain and suffering with the aid of a mysterious Prophet man. The set up begins with a seemingly innocent guy, Jack Omaha, as he tells the tale of these people who were strangers at first whose lives are about to intertwine. As the play continues, Jack takes on the role of Montgomery, a man who goes on this journey, and observe the hardships that this adventure takes. The musical, with a book by Abigail Carney and music and lyrics by Elliah Heifetz, began as a "what do you like so let's turn that into a musical" journey that suffered in its execution. Carney's book was filled with ideas, but once the rules of the world took a turn for the surreal, the book became muddy. The plot has a set up of a story teller present throughout, but it soon gets abandoned by the middle of Act I. The conceit of a potential brother and sister dual romance was intriguing and cute until we learn in Act II about the true nature of Abraham and Birch's relationship. It's a bizarre twist that seemingly comes out of nowhere that could have worked had their been clues earlier in the show. The music by Heifetz has its moments of excellence but treads the fine line between period music and feeling too modern and out of place. The young ensemble does a fine job bringing their heart to the stage. The standout performance within the cast come from Chris Camp. Camp’s Abraham had a wonderful mix of hilarity and tenderness with one of the strongest vocals on stage. As the guy with the bad side Wesley, Jamie Bogyo brings a smooth voice to the least fleshed out character. Michael Ruocco as Prophet brings out a sinister side to an intriguing character that wanted to be explored further. On the opposite side of the spectrum, Paul Hinkes as Jack Omaha-slash-Montgomery offered a different stylistic approach to the play, often times appearing as a distraction, hamming it up on stage. Director Jacob Osborne struggled to bring the woes of the Dust Bowl to the stage. The set by David Shatan-Pardo was simple and country-lite but for a musical about a journey, it was not transformative enough. With a script that needed assistance, Osborne needed to be the one to help discover the solutions. Dust Can't Kill Me is a musical put on by some of the future of theater but it needed some guidance to help it receive its full potentials. There was much passion on the stage and on the page but the execution was very youthful. In time, this piece may be something of great note.